Animonda Vom Feinsten Kitten Deluxe is a food for growing cats aged 2 to 12 months. The food contains minerals that promote a healthy growth. 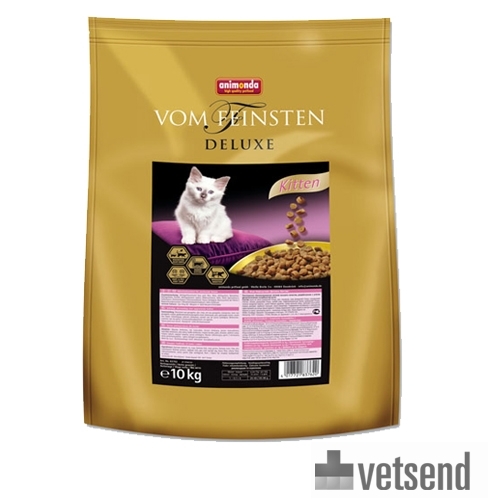 Animonda Vom Feinsten Kitten Deluxe is a dry food for growing cats aged between 2 to 12 months. Animonda dry food for kittens is packed with minerals to promote a healthy growth. Easily digestible protein and Fructooligosaccharides (FOS) help support kittens' gastrointestinal systems and promote optimal digestion of nutrients. Omega-3 and Omega-6 fatty acids promote a glossy, healthy coat. You can combine this dry food with Animonda wet food tubs. Poultry meal (low ash), rice, maize, poultry fat, maize gluten, poultry liver, fish oil, hydrolysed poultry protein, beet pulp, yeast, egg (dried), oat fibre, chicory fibre, calcium carbonate, Yucca schidigera. Have you used Animonda Vom Feinsten Kitten Deluxe before? Let us know what you think about this product.